This article was written by University South Alabama assistant men’s basketball coach Russ Willemsen. Coach Willemsen is in his first year with the Jaguars (13-14) and has been a great addition to the coaching staff there. Previously he coached at Tennessee Tech University and Lee University. Russ is one of the up and coming college basketball coaches in the game today. Many times the difference between finishing in the middle of your league or at the top can be found in the social nuances of your team. How much do they like each other and how well do they get along? If as a basketball coach you feel like your team is struggling to get on the same page, here are a few thoughts to help build and solidify team chemistry. 1) Remove cell phones and headphones at all meals. This forces your players to get to know each other and builds trust. 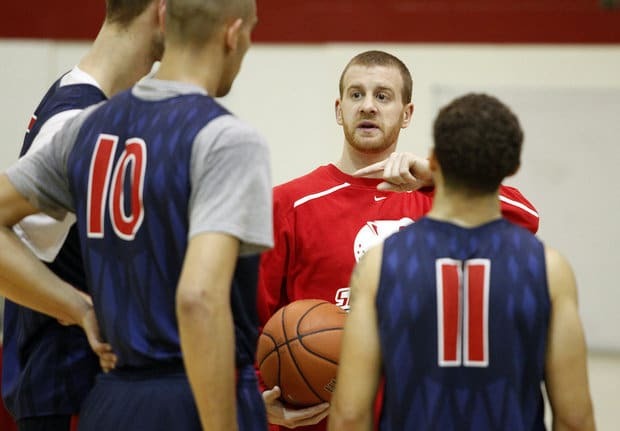 2) Challenge your players to encourage each other, and pick a teammate up. This could be clapping, a text message or public praise. Either way,encouragement builds morale, which boosts team chemistry. 4) Physical touch can be another way to communicate. The Suns tracked Steve Nash and saw he gave 239 high fives in a single game! The study goes on to say the touchiest teams in the NBA were also towards the top of the league in wins. Click here to see the full video. 5) Make your basketball drills competitive. Competition forces players to play at game speed. They will begin to gain confidence in each other, which will give them confidence in the system. 6) Do a community service project together in the off-season. It's always good to give back within your community and this can help keep your players grounded. 7) Peer accountability is another way to build team chemistry. This helps develop pride within your team towards the system. 8) Reward your players for hard work. This could be cutting practice short, taking them for ice cream, or some new team gear. Either way it's a quick shot of confidence in the middle of the season. 9) Hustle plays are awesome for team chemistry. Diving on the floor for a loose ball, passing up a good shot for a great shot, taking a charge or sprinting back on defense to cover for a teammate that is late getting back. 10) Attend a social gathering together. This could be a movie, another team sporting event or any other community gathering that brings your team together. "The most effective way is not always the easy way. Great teams do difficult things together." Unbreakable team chemistry is hard to establish, but the best teams not only have it, they live it! Great message for coaches on how to get your team to come together!! Set goals for the team with your players together will be another ‘teambuilder’.